Is there anything better than a big serving of warm, saucy pasta with lots of melty cheese?! Pasta’s my ultimate comfort food, and now that it’s getting cold outside, it tastes even better. 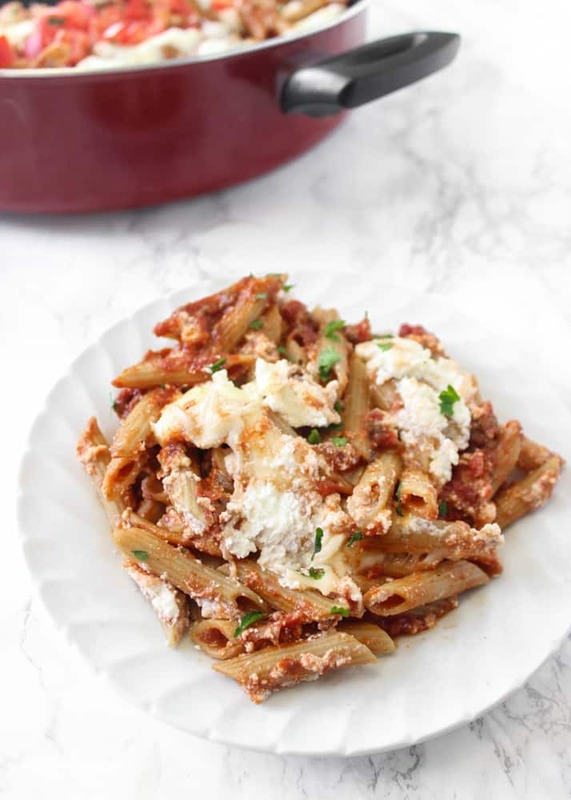 And for dorm cooking, this quick one-skillet baked ziti can’t be beat. The pasta cooks right in the pan with all of the other ingredients, so no separate pot needed. I’ve made this recipe three times now to get the proportions justttttt right and it’s so good– the perfect thing to make for friends all winter long! There are just a few simple steps to making this delicious one-pan pasta. First, brown the ground beef and add the canned tomatoes and uncooked pasta. 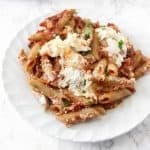 Technically, I used Barilla penne instead of ziti but they’re super similar and I like the sound of baked ziti better than baked penne 🙂 In this recipe, the whole grain taste is hardly noticeable. Add water, cover and let liquid come to a boil, and then simmer on medium-low until pasta is almost cooked to al dente, stirring once or twice. 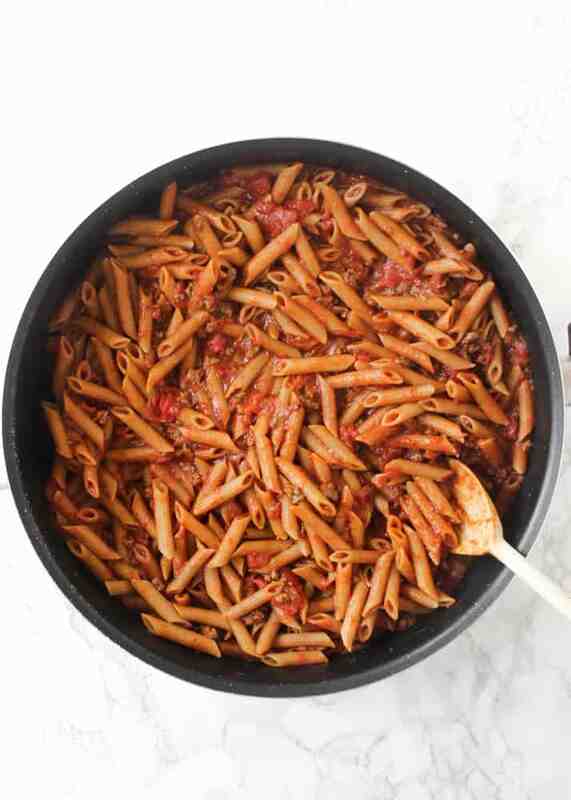 The pasta magically absorbs most of the water while it cooks, leaving you with perfectly saucy pasta. Add dollops of ricotta cheese (the best cheese in the world, in my opinion) and a generous sprinkle of mozzarella cheese. Return the lid to the pot to help the cheese melt. If your skillet’s oven-proof, you can pop the skillet under the broiler for 1-2 minutes to let the cheese get just a little toasty. And that’s all it takes to make this big skillet of melty, cheesy, whole grain goodness. It took all of my willpower to snap a few pictures before digging in. 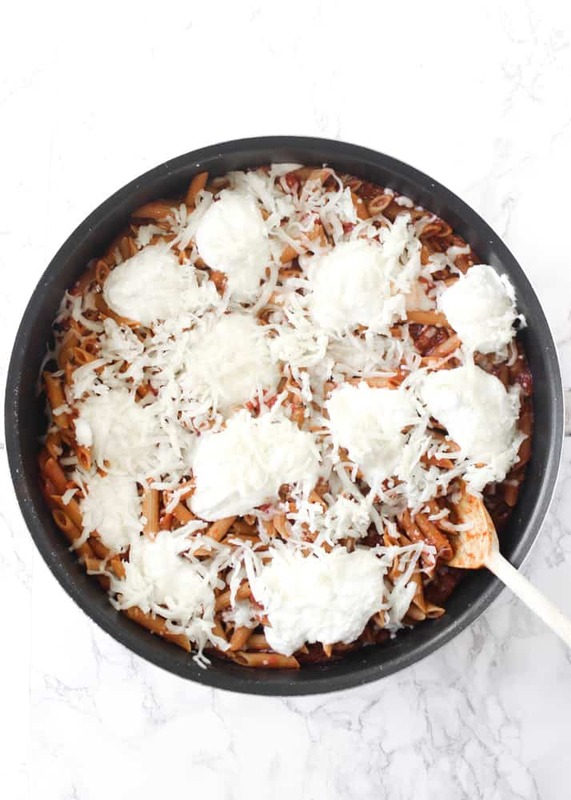 If you try out this one-skillet baked ziti, feel free to let me know in a comment or take a picture and tag me @livbane on Instagram. Hope you enjoy! 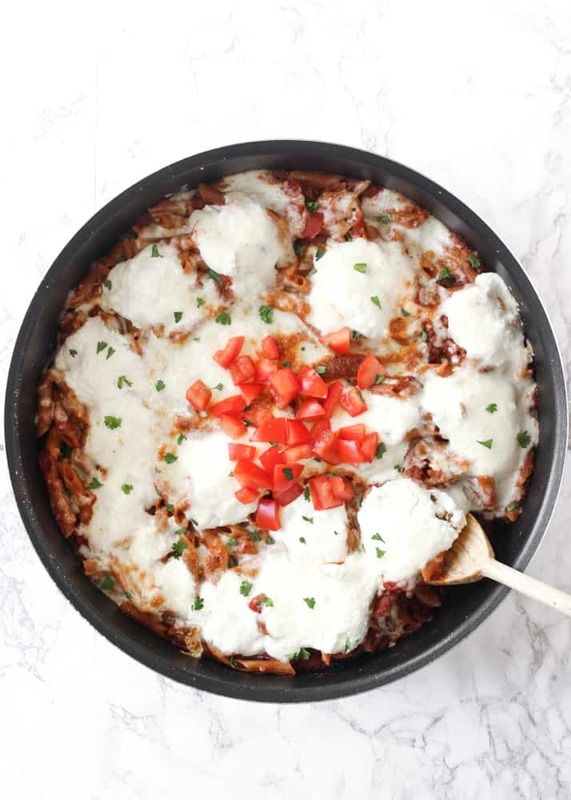 This cheesy-one skillet baked ziti is the perfect comfort food on a cold day, and it's full of whole-grain nutrients! In a large skillet, cook onion and ground beef until beef is browned. Drain grease. Add crushed and diced tomatoes to the pan, along with garlic powder, salt, pepper and stir. Add uncooked pasta to pan. Top with water and stir. Cover pan with lid, turn heat to high, and bring liquid to a boil. 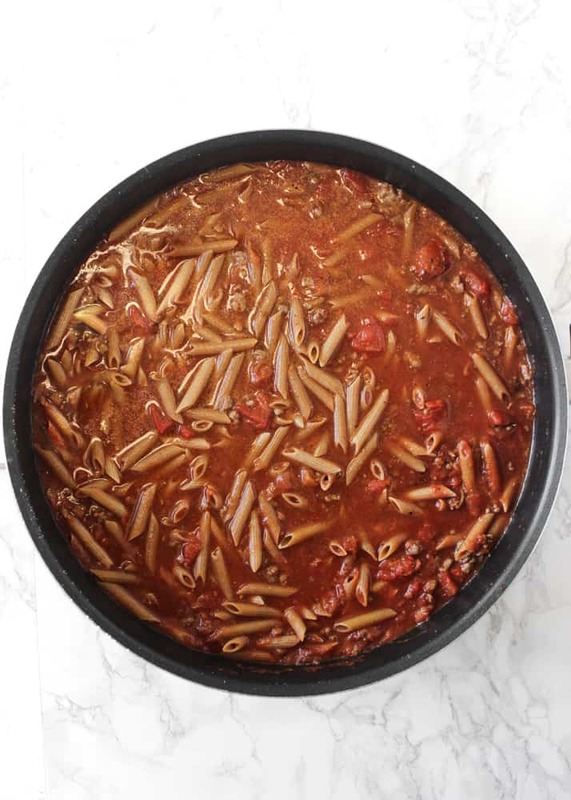 Turn heat down to medium-low and simmer with lid on, cooking until pasta is almost al dente (slightly undercooked still), stirring once or twice during cooking. This will likely be a couple of minutes more than the package directions says since it's on a lower heat than usual (ex: my package said 9 minutes and I did 12 minutes). Stir in up to 1/2 cup more water if pasta seems dry. Top with dollops of ricotta cheese and sprinkle with shredded mozzarella cheese. Return lid to pan to allow cheese to melt. Optional: if the skillet is oven-safe, place under broiler for one to two minutes. Top with fresh tomato and parsley, if desired, and serve. Looking for more pasta recipes? Check out my spaghetti squash pasta bowls or broccoli pesto penne with chicken sausage! Thanks, Gee! I try to only post simple recipes, and of course, they have to taste great, too! I can personally verify that this recipe is delicious! This not only looks super delicious, but it looks really simple too. I’m pinning it for later, because I know for sure it’s something my BF would love for an at-home date night. Thanks for sharing! Awesome! 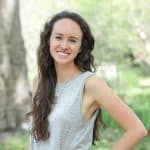 Thanks for pinning, Amanda! This looks so delicious! I can’t wait to try this recipe this weekend! Thanks, Amanda! Hope you enjoy it! Hey Liv – what a gorgeous dish! I always make my kids pasta the night before their track meets. YES! Perfect for carb loading and my fave kind of comfort food for sure. Barilla is what we prefer at our house too.. 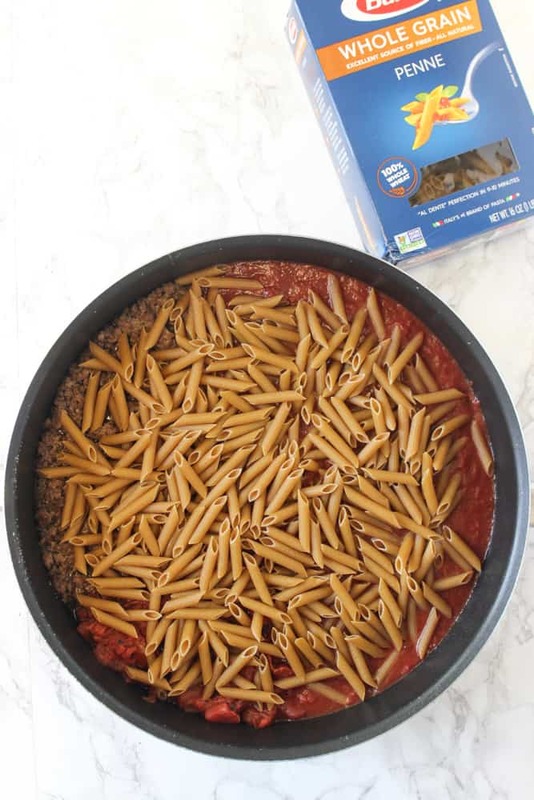 Pasta bakes are serious comfort food to me and this one looks incredible! I only ever buy gluten free pasta because well, being a coeliac that’s all I can eat 😛 Luckily we’ve found great gluten free pasta that Jesse happily eats so I’m not buying and making two types! That’s awesome! I think rice pasta is a great gluten-free alternative and I’ve heard about quinoa pasta now, too. Haven’t tried that one yet! Oh man, those beautiful lumps of ricotta cheese and mozzarella on top look AMAZING! 🙂 I love one pan pasta meals. So do I! And I seriously love ricotta. I could almost eat it by the spoonful! what did you guys make with rice pasta all the time? i actually don’t really remember seeing it on your blog! I honestly just haven’t posted many pasta recipes on the blog yet but we pretty much cooked with rice pasta exclusively when I was growing up! We used it for baked ziti, chicken & pasta, soup, etc. Mmmmm I loveeeee me some cheesy pasta!! Though I would need to swap these out for gluten-free noodles this recipe sounds amazing! I bet this would be delish with gluten-free noodles, too! Holy cow this looks so amazing!! Ricotta Cheese is my favorite too! That’s a great post idea! I’m no expert but I like to bring salads. A great winter salad is romaine or spinach with nuts, chopped apples or pears, and feta or goat cheese. Load up on all of those toppings and you have quite a salad! Poppyseed dressing on the side is wonderful. Another idea (if you can keep them warm somehow) is bringing a big serving dish of roasted winter veggies, like these. People seem to love roasted veggies and who can blame them? They’re delicious!